This entry was posted in Black Churches Burning, Charleston, Race, South Carolina, Terrorism, White Supremacists and tagged Black Churches Burning, Confederate Flag, South Carolina, Terrorism on July 4, 2015 by speakingthosethings. Whatever points Nikki Haley made on the national stage after the assassination of State Senator, Reverend Clementa Pinckney and the cold-blooded murder of eight congregants of the Mother Emmanuel AME Church have been lost with her premature, yet emphatic defense of the most recent black church burned in Greeleyville, South Carolina. Mt. Zion AME Church was burned to the ground on June 30, 2015. A total of eight black churches have been burned since the murders at Mother Emanuel on June 17th. MSNBC questions the assertions made by the South Carolina Governor, Nikki Haley, that the church was struck by lightning. Joy Reid of MSNBC reports that the investigation is still ongoing by the local fire department, and that a determination has not yet been made of the origin of the fire. 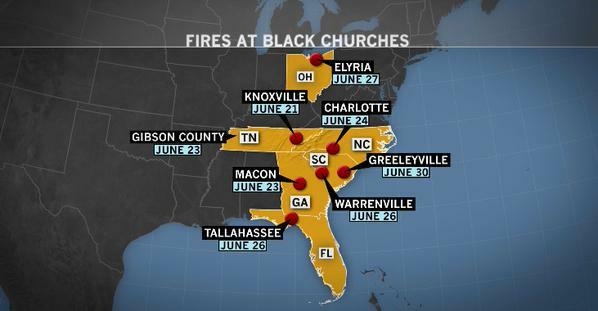 The MSNBC Black Churches Burning video details the latest in this ongoing terrorist attack upon black churches in the south. I absolutely do not believe Nikki Haley’s feigned tears at the loss of nine precious souls on June 17th at Emanuel AME Church. As an Indian American, it is clear that Nikki Haley has adopted the rhetoric, demeanor and denial of malicious racism perpetrated by southern white supremacists in order to maintain her power seat. I still marvel that black Americans choose to live in southern states. This entry was posted in Black Churches Burning, Clementa Pinckney, MSNBC, Race, South Carolina, Terrorism, White Supremacists and tagged Black Churches Burning, Clementa Pinckney, MSNBC, Mt. Zion AME Church, Racism, South Carolina, White Supremacists on July 4, 2015 by speakingthosethings.